Tales of the Samurai Tailor from New York, America. Customer service – Samurai Style. See also: John Belushi, Samurai Tailor, Saturday Night Live, Toshiro Mifune, Yojimbo. At Henry Herbert HQ, we were debating what criteria a bar had to meet to make it on to our list of London cocktail bars – especially when the options are so vast and numerous in the city. We came to the conclusion that there must have been something unique, just a little bit different and memorable about each of these venues. Some we spotted ourselves, but many have actually come as recommendations from friends and customers of Henry Herbert. So the most important criteria for this list has simply been: a Henry Herbert friend, colleague or customer must have enjoyed a cocktail or two at each of these locations and told us about it! We would love to hear your recommendations too, just drop us a line here. It’s not a *whispers* table reservation, its an appointment. Make an appointment to see the Detective at the Evans & Peel Detective Agency, and you may just get a look into the secret room behind the bookcase. This is a proper Prohibition-era speakeasy with all the trappings. Enter another world, the residence of one Phileas Fogg, Esq, of Around the World in 80 Days fame. You never know what characters you might meet at the London residence of the esteemed M. Phileas J Fogg. Don’t forget to look up and around to see souvenirs from his travels. As a side note, we think this venue has one of the best dressed staff in London, and we are fans of his House rules (stated on the front of the menu). Elegant intimate cocktail bar with fun (and generously sized) American-style small food (not quite a meal, but more than just a bar snack) to accompany great cocktails. Dark wood furnishings offset the metal bar, and the walls are adorned with black and white photographic prints. 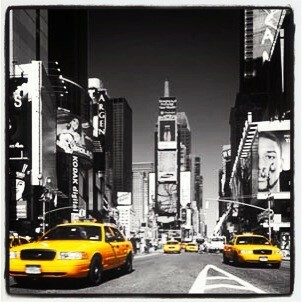 Go with one friend or many. We haven’t been here for a while, but we’re told its going as strong as ever – an institution in the Notting Hill/Westbourne Grove location. Go for a fairy grotto-like experience, and for the eccentric and unique interiors as well as the cocktails. Champagne cocktails are the name of the game. Enjoy them in 1920s Art Deco black and gold opulence, whilst listening to the live singer accompanied by a pianist. 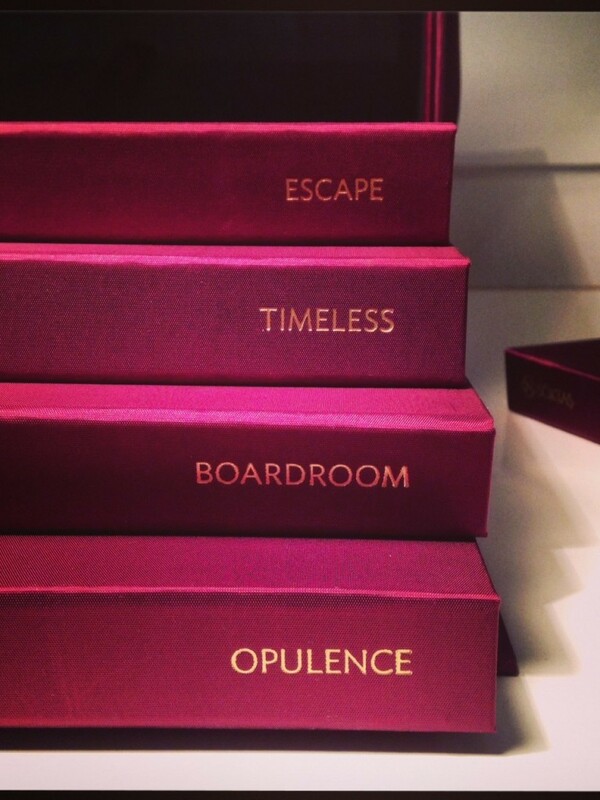 In a word: luxurious. And although we said “Top 5”, we couldn’t help but sneak in a couple more close to Savile Row, where our tailors can be found. They have prosecco on tap, who can argue with that? We particularly like the chic Cecconi interiors – black and white flooring matched with dark green leather upholstery. Cecconi’s has a 3 sided bar where you can sit to enjoy and observe the creation of your cocktail, as well as a three course meal of fine and fresh Italian fare. There is a strong art focus here – most of the interiors feature contemporary/modern art in any kind of media (light, sculptural, you name it). The question is whether a guest will spot it all or not. Once we saw Heston Blumenthal enjoying a cocktail here. There are at least 3 bars housed in this venue. Interiors seem to be refreshed every couple of years so the main dining area never stays quite the same. And they also do a mean Sunday Roast. Go, not just for the tender beef cooked to pink perfection in the centre, but for the dessert cart after. These are some of the Henry Herbert team’s “Top 5 Valentine’s Day gifts for Him” – or indeed, Any Day gifts for the modern gentleman! 1) These innovative magnetic collar stiffeners by Stiffies. The company says: “The idea started when its founders dress code changed at work. Ties were no longer needed, however they still had to look smart. After a couple of months they became increasingly frustrated – even with collar stiffeners their shirt drooped below their suit jacket and they felt they lost their mojo. So with this they came up with the idea of magnetic collar stiffeners, that not only kept your collar stiff, but most importantly kept it upright.” We think they are brilliant! 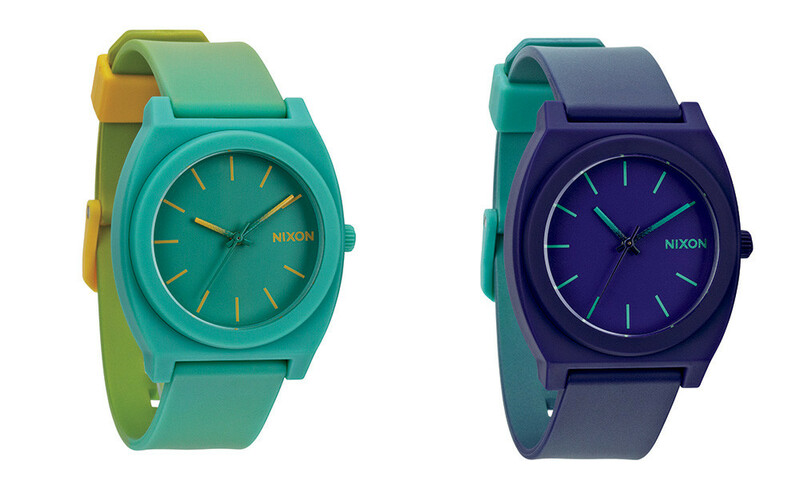 2) Colourful watches by Nixon – sleek, summery, and they won’t break the bank. 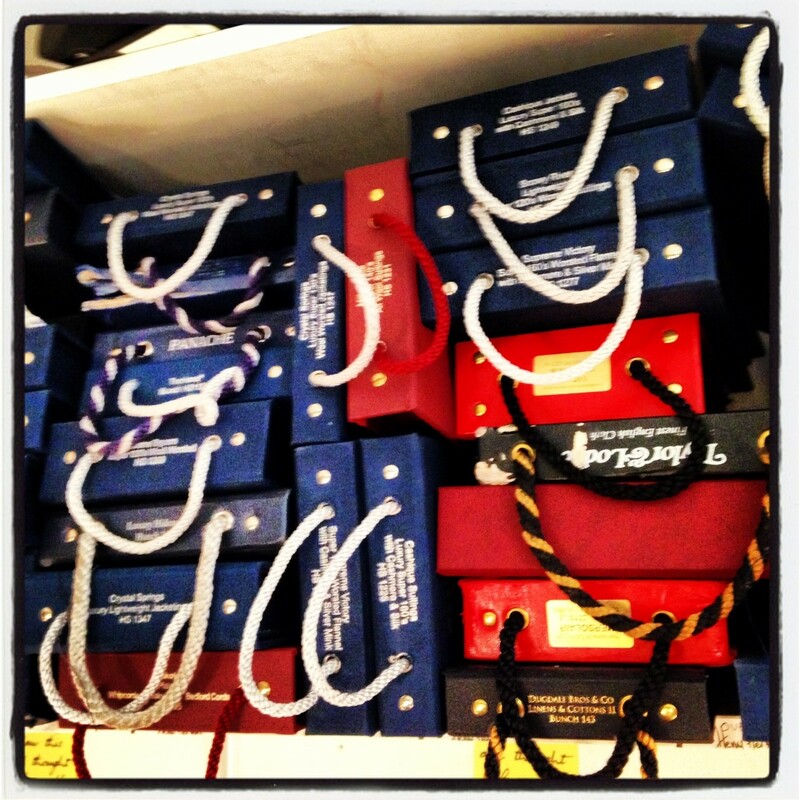 There are 27 colours to choose from – almost one for each day of the month of February! Why stop at just one? 3) Mr & Mrs Smith boutique hotels “Get a Room” voucher. Mr & Mrs Smith have done all the hard work for us by curating – hand-picking – a selection of the most remarkable – and characterful – boutique hotels in the world. The Mr & Mrs Smith team have personally visited and anonymously reviewed each location and applied their exacting standards in their selection process. There is something to suit every kind of holiday you can imagine. And this means the both of you get to enjoy the treat…. Whilst we think a stylish leather holdall or carry-all can seriously up the style stakes and handsomely complement a bespoke suit, there are just some times when a gentleman doesn’t want to hoist all that heavy luggage around (when making the trek from one end of Heathrow to the other). Enter the sleek aluminium Rimowa, with its signature “go faster” grooves. Swivelling silently on four wheels, this remarkably sleek piece of travel engineering will follow quietly in your hand, distinguished and uncomplaining, around the world like the most loyal of canine friends. We are huge fans. 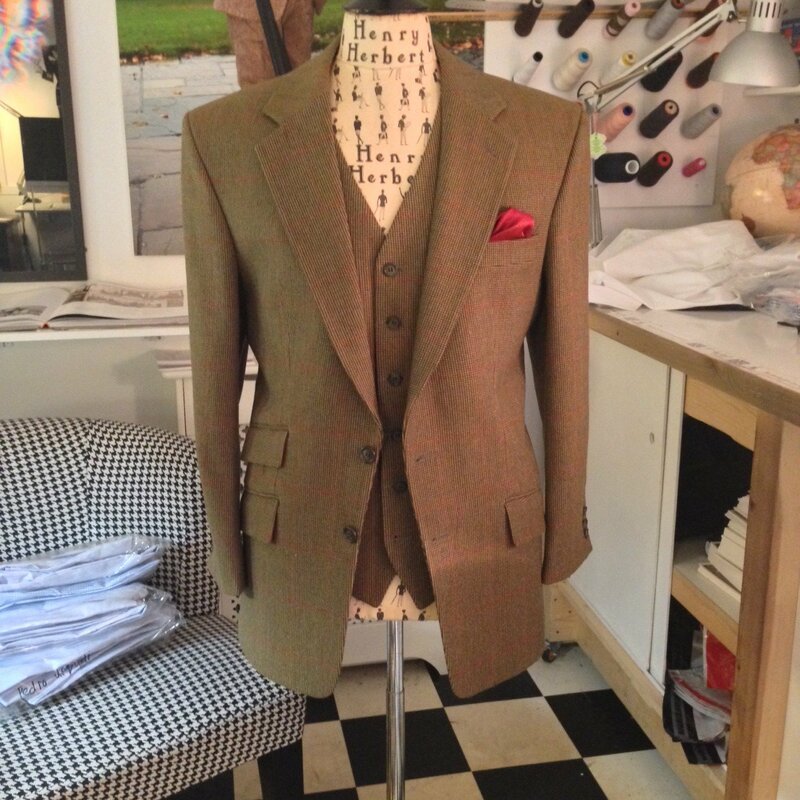 A Henry Herbert Gift Voucher for one suit lets the recipient create their own very own tailored English suit, from the finest English & Scottish wools. Our perfectly tailored hand-crafted suits are made in England and our tailors will guide them through all the choices, styles and fabrics available. You can personalise the message inside the card too. Happy Friday / Valentine’s Day! 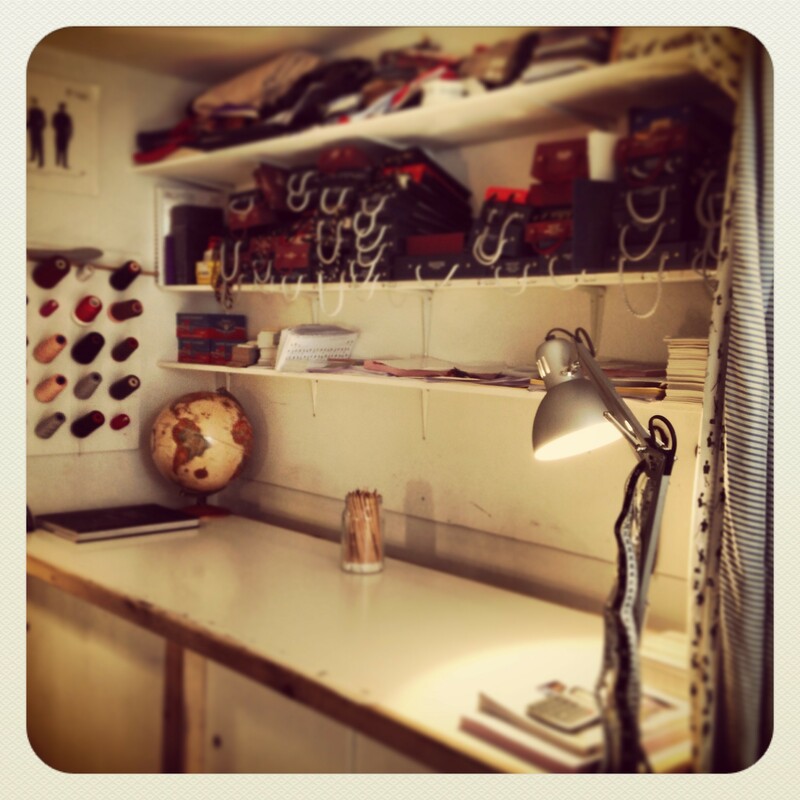 This is one of the work tables at our London workshop. During the week, you will often find this table heavily loaded with swathes of cloth that have been ordered, ready to be cut. 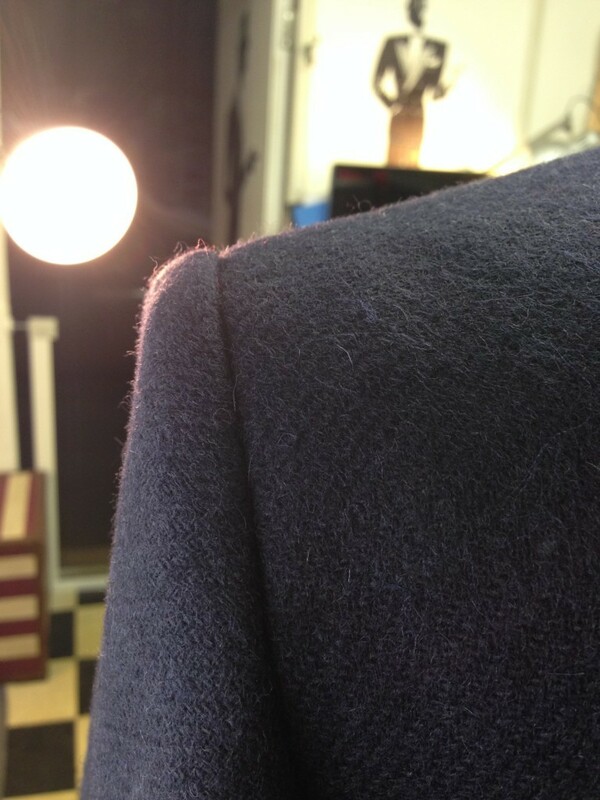 The cutting table is often draped in cloth, held down by weights, whilst our tailors strike a pattern. 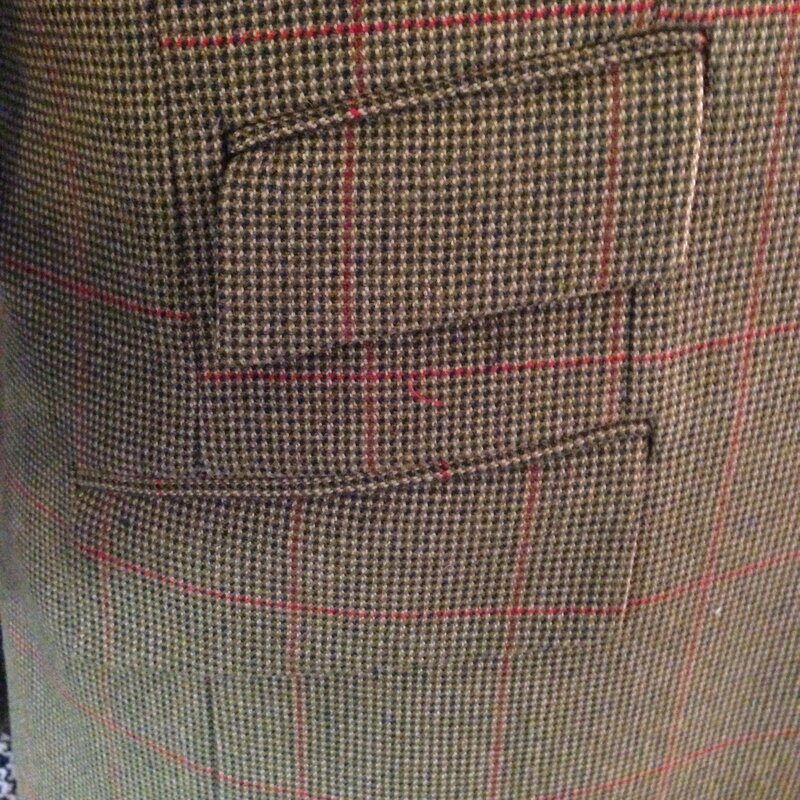 Bespoke suits and bespoke shirts are made to each gentleman’s individual measurements, or his personal “pattern”. No two patterns are the same! 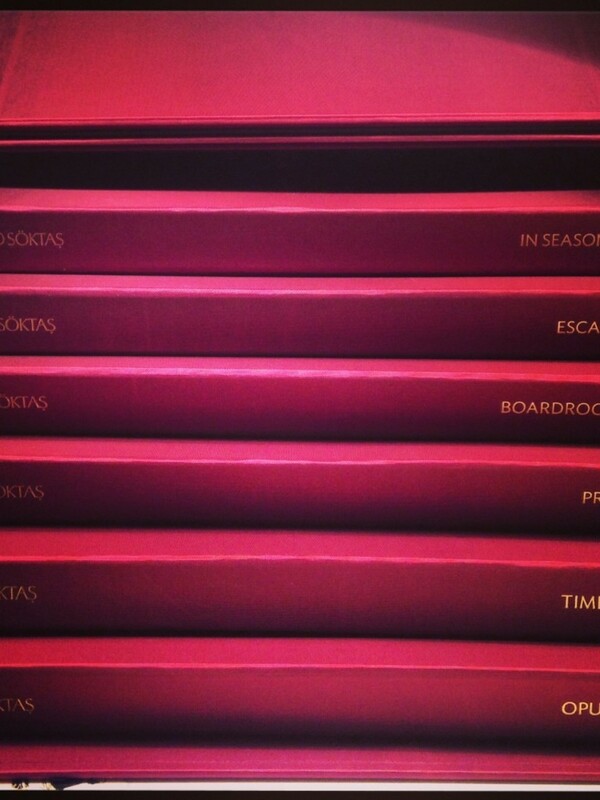 On the shelves above the work table, you see just some of the fabric books we have – for bespoke suits, shirts, trousers, linings, waistcoats, overcoats, dinner suits, morning suits and jackets. 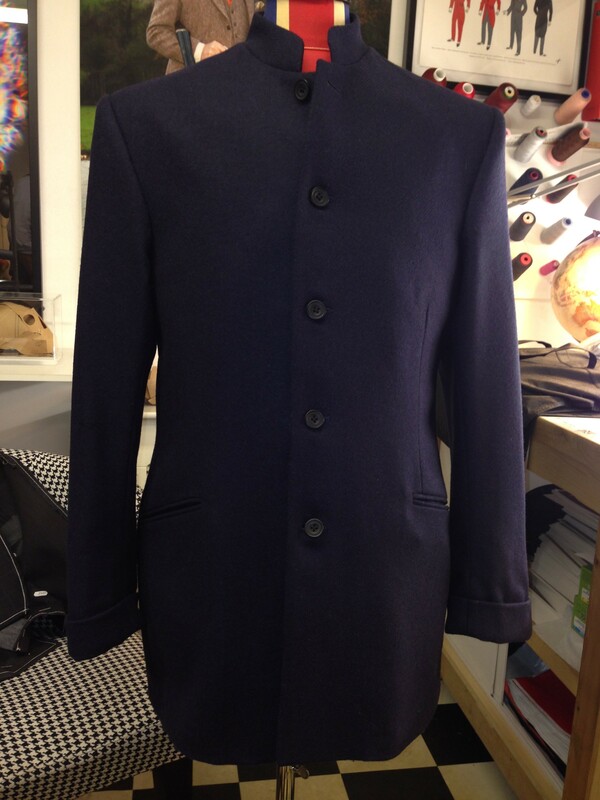 Many of these will travel together with our tailors, when they are out at client appointments, to ensure that no client is ever short of shirt and suit fabric choices – cottons, wools, cashmere, flannel, tweeds in all imaginable colours and patterns. 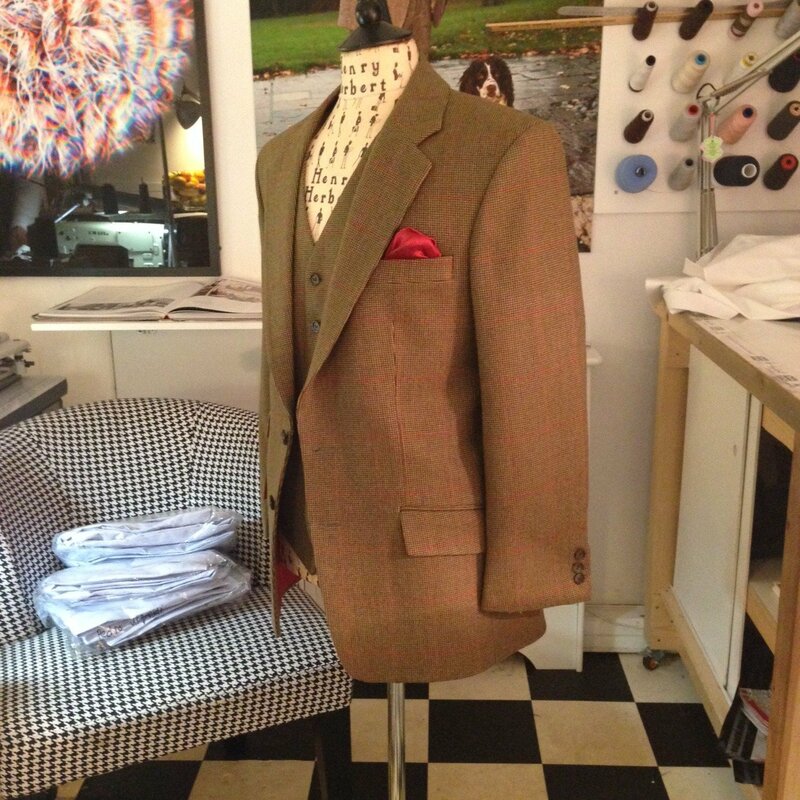 At Henry Herbert Tailors, we use only the finest British fabrics, sourced and woven in the UK. 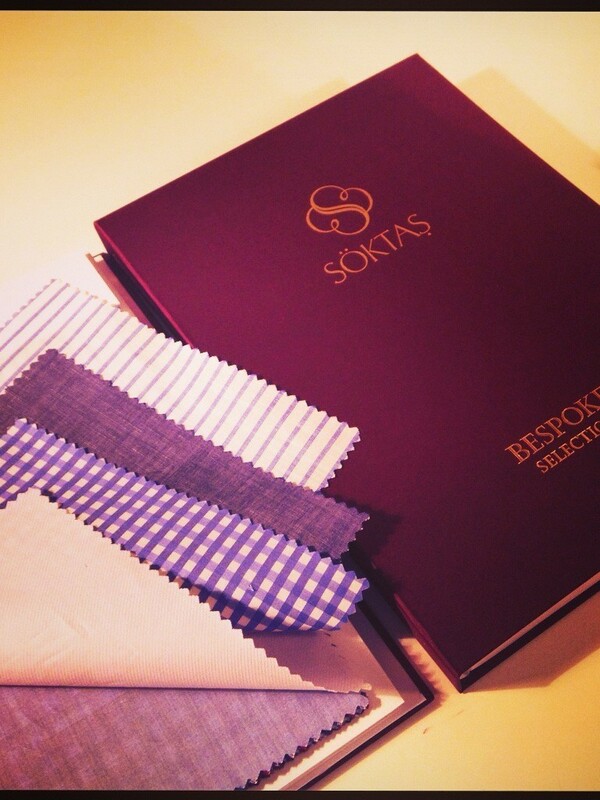 Our experienced tailors will guide you through the thousands of suitable fabric types and colours available. 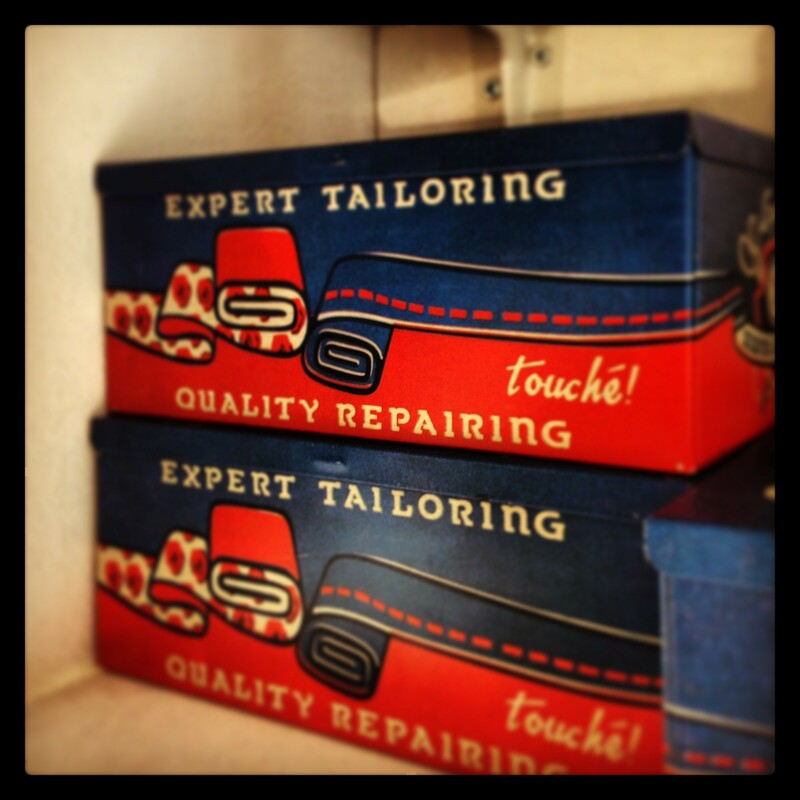 Tidy boxes to stash our bits and bobs – buttons, pins, chalk, scissors, safety pins, measuring tapes, spare bits of fabric (we never know when those might come in handy), needles / thimbles / plasters (we find those tend to be needed in threes). 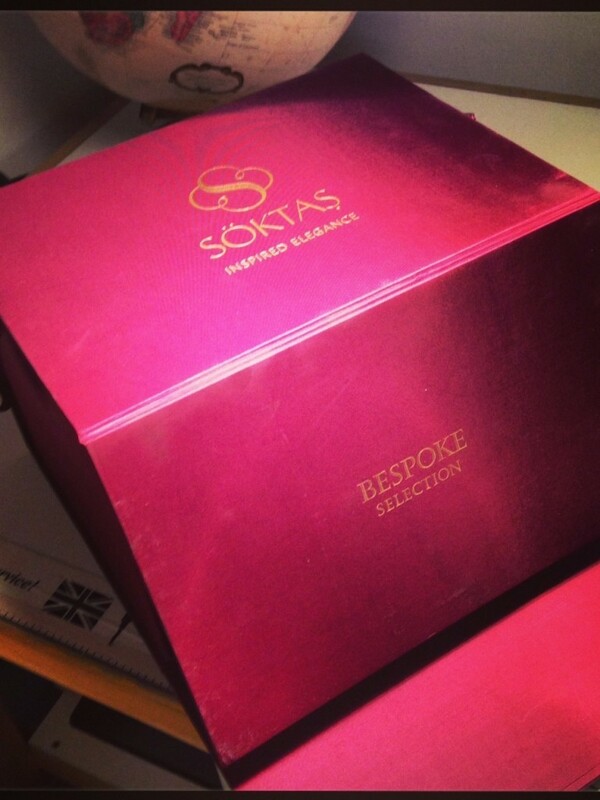 We are particularly fond of the appropriate wording on these boxes: “expert tailoring”, a daily reminder of the highest Savile Row standards that we work to. Finally, we like to keep our guests comfortable when they visit us. 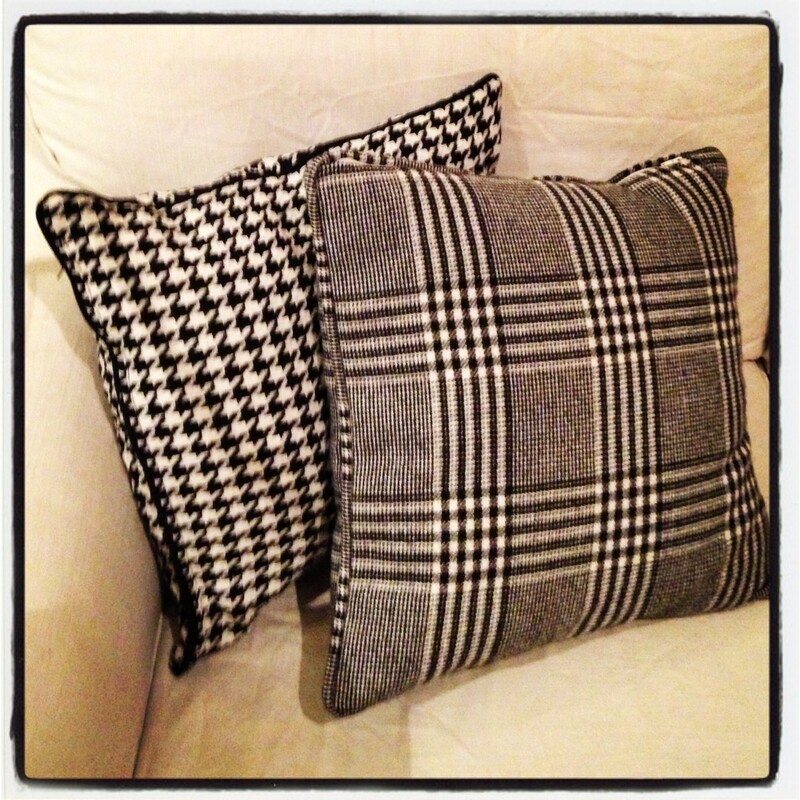 Dogtooth and Prince of Wales check work well on furnishing and accessories too, we find! You can either visit us at our Savile Row (Mon-Fri 9.00-5.00pm) or Gray’s Inn Road premises (Mon-Sat 8.00am – 8.00pm), or we can visit you wherever and whenever is good for you, with our Savile Row by Scooter service. 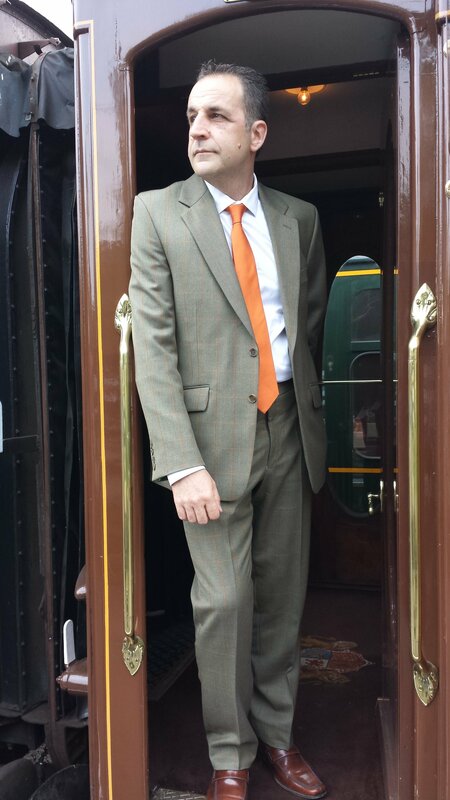 The classic English bespoke tweed suit needs no further introduction. The cloth: This tweed suit jacket and waistcoat are hand-crafted from a heavier 13oz tweed, from Holland and Sherry and is appropriate for the outdoors and unforgiving winters. 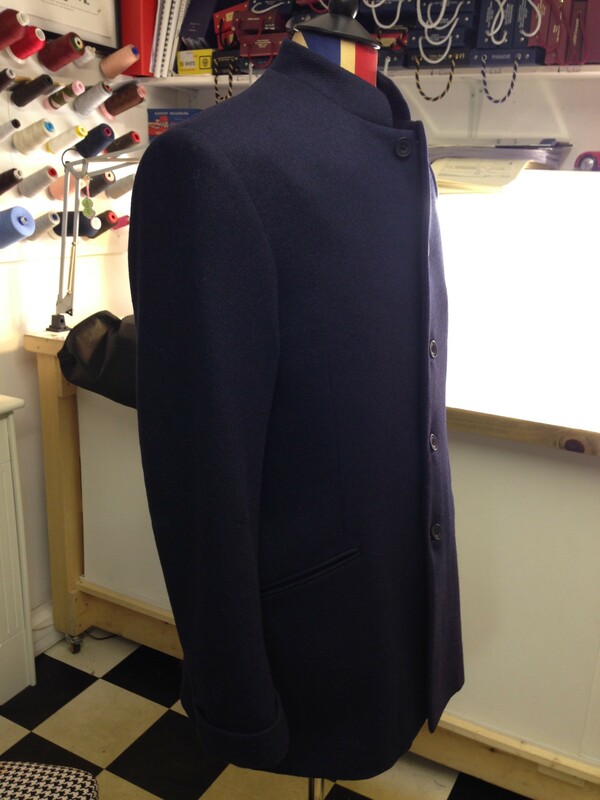 The cut: slim fitting and proportionate. It is a popular British cut because it bears some classic features, for example the waist nips in slightly higher than our European friends usually prefer, which creates a taller, slimmer looking silhouette with a slightly longer skirt. 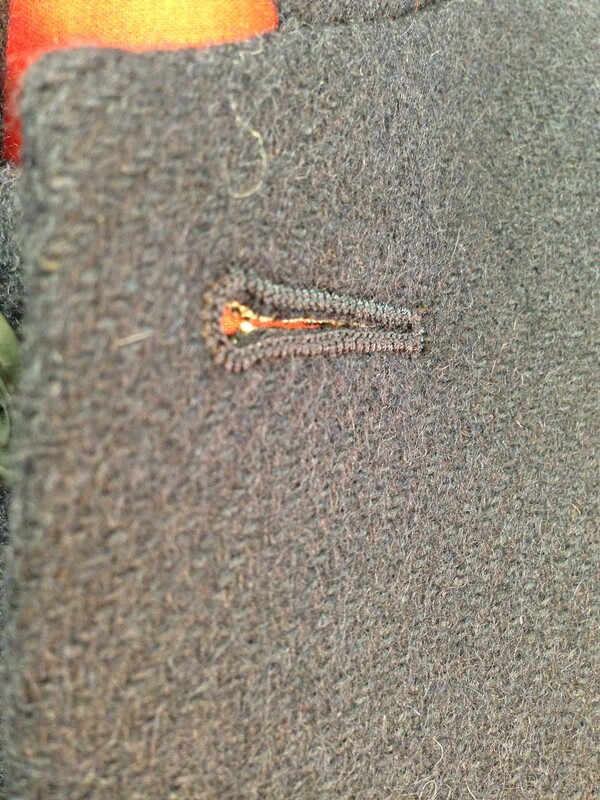 There is no better time, as temperatures drop, to be thinking about a tweed suit. 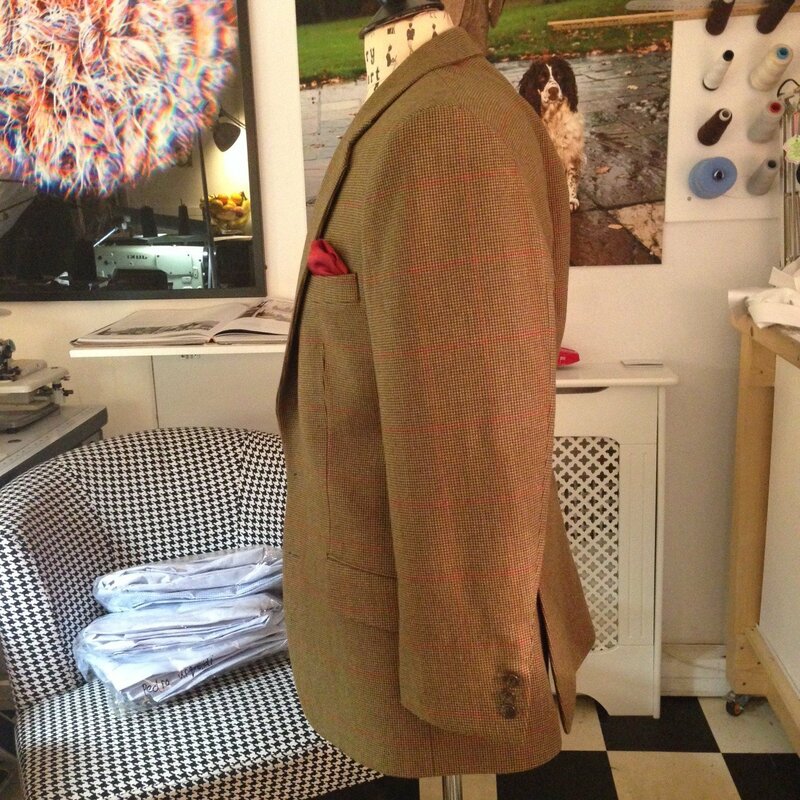 Our tailoring team can guide you through the options available. 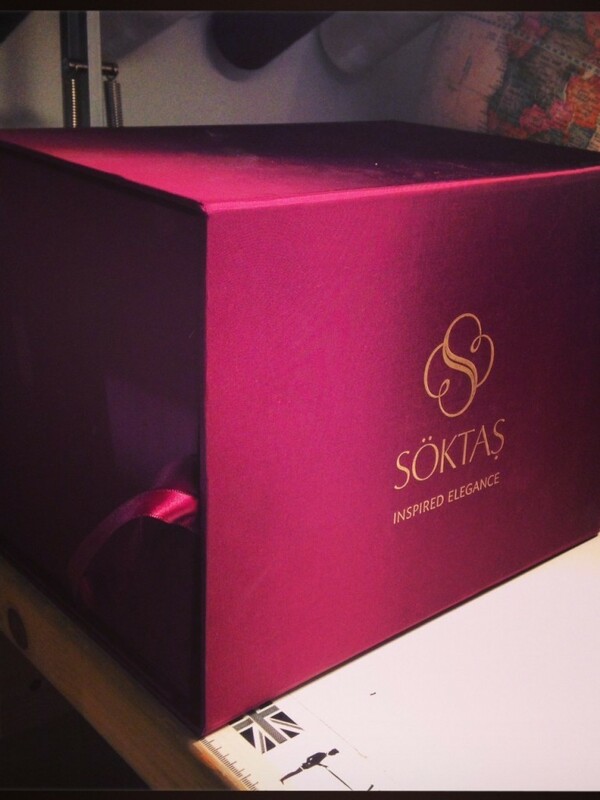 We would be delighted to have a discussion: just drop us a line to book an appointment! 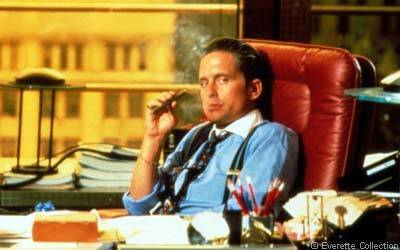 1) Gordon Gekko. Take one blue shirt with white collar and cuffs. Roll sleeves back to the elbow, add braces, slicked back hair, a cigar and a sprinkling of insider trading quotes and say “Greed is Good” a lot. 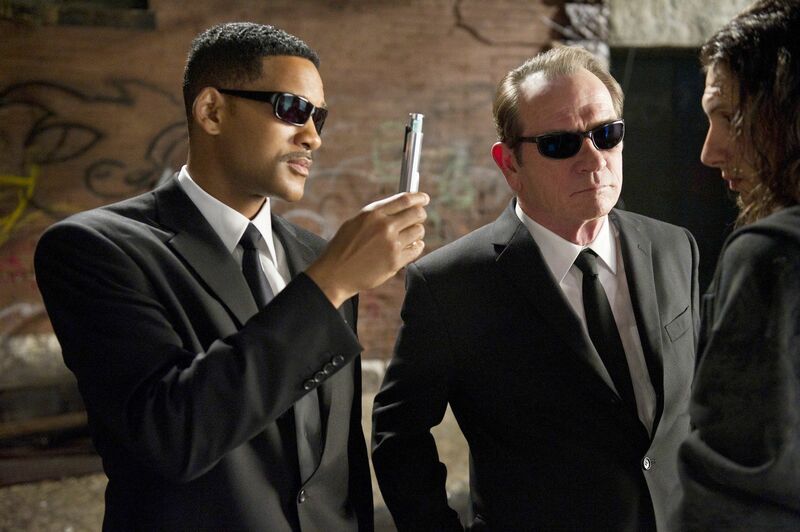 2) Men in Black, Agent J, K. Take one black suit. Add a black tie, and sunglasses. Easy! Neuralizer optional. 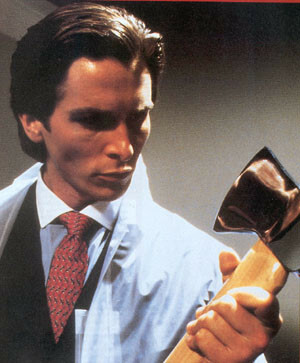 3) Patrick Bateman from American Psycho. Running with the blue shirt/white collar contrast theme, add a red tie, and a rain jacket/poncho from your local supermarket, and an axe from a toy store (preferably) or tool shop (please be careful!). Spray fake blood. 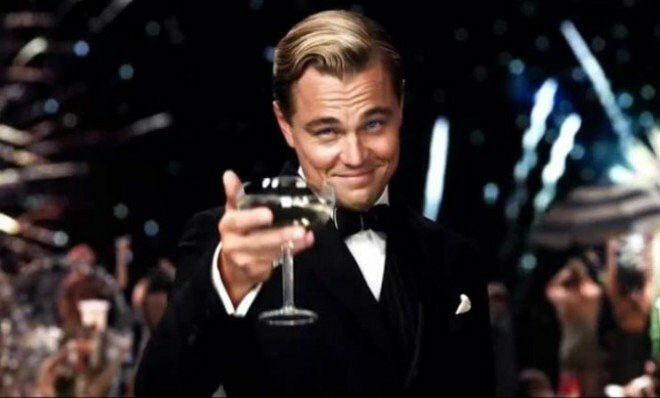 4) Jay Gatsby, from The Great Gatsby. Why, just don your dinner suit, old sport. Add martini glass and some smugly raised eyebrows. 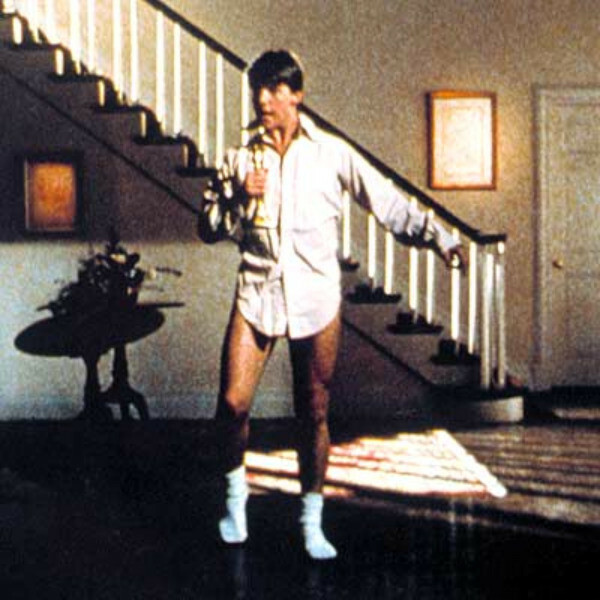 5) Joel Goodson/Tom Cruise from Risky Business. Last but not least, one for the brave, or those who don’t get chilly easily. Remove most of your suit and tie, leaving only a shirt and white socks. Grab any microphone-like prop. Mime. Indulge in some dance moves. And there you have it. 5 easy emergency Halloween costumes, using your bespoke suits and shirts! Happy Halloween from all of us at Henry Herbert.